Pruning season is upon us. 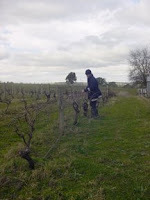 James has been out in the vineyard on chilly mornings and afternoons working on the shiraz vines. Winter does seem to go so fast - I guess it's because pruning is such a slow job (as compared to tying the vines onto the wires once they have been pruned) and the weeks seem to pass by. If you can manage to not go out on the days where it is too blustery - especially high on the peak of the hill where the vineyard is - it is quite a pleasant, albeit very tiring, job. The view over the Flaxman's Valley is rather spectacular especially on misty mornings. Winter also generally means it is time to get the riesling, and sometimes, the shiraz, bottled. Our 2008 riesling will be bottled within the next few weeks followed soon after by some of our past vintage (not 2008) red wines. Then it will be time to get labels printed, tech data sheets formatted and all the fun things that come along with each new vintage (oh, and tasting the wines as well!). It is exciting to see what time has produced with each variety, especially the riesling as it is not a very long wait from bottling until selling. By all accounts, the 2008 Vintage was a very good one to us, and we look forward to having our "new" wines available soon. A Silver medal from San Francisco!